These tongs were created to help serving tasty pasta dishes. An indispensable accessory on your dinning table! It's also ideal to serve other dishes like meat, vegetables or salads. An useful acessory to assist in the everyday tasks in your kitchen. Serve with elegance and perfection, and discover the versatility of this tool! 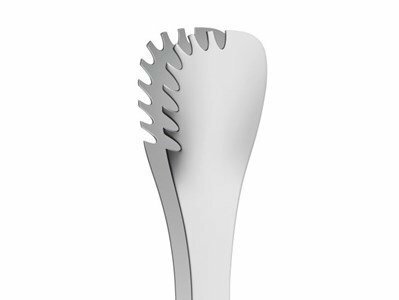 In polished stainless steel 18/10 Cromargan ® is a durable piece, resistant to food acids and washable in the dishwasher.